My oven stopped working recently which resulted in my need for a new “toaster oven.” I know there are differences between toaster ovens and convection ovens but let’s face facts, many people still refer to it as a toaster oven. I know I call it a toaster oven. Sometimes once you get used to calling something by a particular name it just sticks. Ba-dum ching! 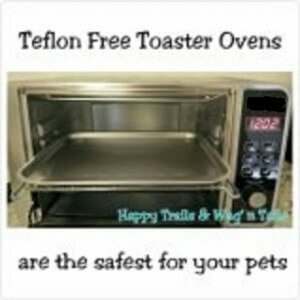 As I was looking at ovens with the best ratings or all the bells & whistles, I quickly realized most had a non-stick interior which contained Teflon, PFOA, or PTFE and how it was having negative health effects on pets and people. Teflon is a trademark name and therefore it may be used in another form which you may not easily recognize. This stuff is everywhere folks. For example, it very well may be on the warming plate of your coffee maker. Check out my toxic-free coffee maker post for other hazards hiding in your coffee maker. One company uses Durastone II which contains Teflon particles. Another “well known” company was very cryptic about what is in their non-stick coating. I understand wanting to protect your proprietary product or formulation but it’s that same lack of transparency that will make you lose customers wanting to know this information for health reasons. I found many comments on various websites stating birds have become ill or passed away from the use of non-stick ovens. As of Dec. 2018, a post has been circulating around Facebook about birds dying after someone used the self-cleaning function on their full-size oven. From what I gathered, the bird owner was well aware of the effects ovens can have on birds and thought they had taken all the precaution necessary to protect their birds. Additionally, people have experienced flu-like symptoms. I found this information on multiple websites such as on the website of the company who makes the Teflon coating and EWG (Environmental Working Group). *I saw it first hand how severe the reaction can be when someone I know had to run out of the house when this function was turned on. If this is what it’s doing to birds and people, I was NOT going to take a chance with my dog! To top it off, I’m sensitive to smells. Yeah, that’s not going to work. I’ll take ways to say no for $1000 Alex! Last year I did a bit of research on this topic only to find one oven that met these criteria. In January 2016, this search was taken to a whole new level! I spent more than 20 hours searching the internet to see if any other convection ovens met my needs. I went to various websites to read customer reviews, complaint boards, calling companies and reached out to a few friends, one of which is familiar with cookware. I have since learned Teflon was to be banned in 2015 and thought this may result in more options to choose from. That was quickly dispelled when I realized the oven could have been manufactured before the ban and still be available for sale. One contender was Steam Convection Oven. As far as I could tell there was no non-stick interior, it had a lot of great reviews and a 5-year warranty. I was really interested in it because steam is a healthy way to cook. I only decided against it because it was almost $250 and that not in the budget at this time. Another option is this PFOA free oven. According to the company website, this version of the oven is PFOA & PTFE free! It comes in several color options to match your other appliances or add a punch of color. Finally, a customer brought to my attention a high-end PFOA free countertop oven. If you own other high-end appliances and like the quality, now you can own a compact version! It has 6 cooking modes, inside light, fits 9 x 13 dishes, comes in 3 colors, a temperature probe, and has a 5-year warranty. 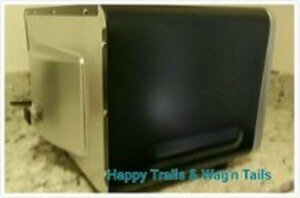 I read a lot of reviews and many customers seem to love it as their main oven and even used it as their secondary oven when cooking holiday dinners. When pulling it out if the box, it was bigger than I expected but for me, that was a good thing. It features 3 different rack positions, 1 rack, 1 “baking” pan, and a crumb tray. The crumb tray slides out for easy cleaning. That is a winner! Why? My last toaster oven forced me to pick up the oven, pop the bottom open and wipe it down while holding it or laying it on its side. I was not a fan but I made it work. You can turn off the beeping sound the buttons make. Keep in mind if you want a reminder that the cooking cycle has finished, you will have to set a timer on another device. The back “bubbles out” which may be to better accommodate a pizza. Yum pizza! The description I read said it fits “most” large pizzas. I can tell you I have purchased two pizzas and they both fit inside. I cut up some lime and squeezed it into my water. Looking at the end piece, I thought this will make a perfect little scrubber. I put some baking soda on the lime to clean the glass door. After letting it sit for approximately 30 minutes, it came off with ease. My only dislike is the pan that comes with the oven. After a month or so of use, the pan should not get bent/warped. Luckily I heard it make the pop noise and was able to bend it back into shape (using an oven mitt so I didn’t burn myself). Also, it quickly had some rust spots on it although it was cleaned and dried immediately after use. I contacted the company and they offered to send me a new pan. Finally, I would have liked a Stainless Steel Broil and Roast Set. Why? If I want to cook something like burgers and fries, I don’t want the burger or fries cooking in the grease. With the broiler pan, the fat/grease drips through the grate into the below pan. I plan to get this 3 Piece Ceramic Toaster Oven Set for making pizza, muffins, and brownies. When I upgrade my oven, it’s a toss-up between the steam oven or getting one of the bigger ovens that fit a quarter sheet pan . For deep discounts on kitchen gadgets check out their open box items. Many are in good shape but may have a scratch or a missing manual. Excited and want to get your new oven in a hurry? You may want to Try Amazon Prime 30-Day Free Trial. You’ll get free 2-day shipping!